Hello and thank you for taking a look at our latest blog, in what we hope will be a popular series. You know we tell you that we read all the feedback we get from our exhibitions? Well, it’s true! And something that we repeatedly read on our Snapshots, is that you would like to know more about the photographs and why, how and when the photographer captured it. To start the series, we have asked Mr Leka Huie, the winner of our ‘Exposure’ competition, a few questions about his winning image, and we have tried to find out more about the man behind the camera. Mr Huie is a Hong Kong national. He graduated from Humber College, Toronto, Canada with a degree in Creative Photography and was awarded ‘Student of the Year’ by Professional Photographer of Ontario in the same year. 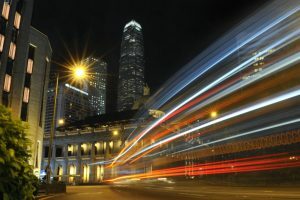 The image shows trails of lights from traffic in the Hong Kong Central District. Mr Huie always goes to the Central District to take spectacular skyline and architecture images, but on this occasion, he decided to focus instead on the lights from the traffic. The image took him fifteen minutes to capture, before he was happy with the image – not too long at all! Mr Huie has been interested in photography since the age of 12, and as we know, he went on to get a degree in Creative Photography in Canada. The best piece of advice he was given, as a photographer, was to always be patient – good advice! If Mr Huie could go anywhere in the world, he would go to Japan. As he says, it is a great place for taking photographs as everywhere looks and feels so clean. When asked where he might be going on a photography trip next, Mr Huie replies, with I believe a twinkle in his eyes, ‘Maybe London, for me to remember the great old days when Hong Kong was a British Colony’! Well, Mr Huie, thank you for talking to us, we would love to have you visit London, and we look forward to seeing the photographs you capture while you’re here!